Probably my most popular blog post ever has been the Language Power Struggles one from way back in 2010. It’s hard to believe it’s been 9 years since I wrote that, and when I recently discussed the issue with Jared in our podcast, I realized that my attitudes have changed a bit over the years. And yet I can clearly remember routinely participating in these meaningless battles of will, whether at a restaurant talking to the server, or in a store, or getting a haircut… And now I recognize that back in the beginning a big part of what drove the stubbornness to engage in the struggles was insecurity. As if by refusing to communicate with me in Chinese, the other person was insulting the Chinese level I had worked so hard to achieve. I imagine the other person may often have felt the same way. So then you’re left with two egos duking it out over language supremacy, but also not really even caring about the other person’s level. So nowadays I’m a lot more laid back and compassionate about people insisting on using English with me. Not everything has to be about principles of efficiency or showing proper “respect.” I know, it sure took me long enough to recognize this (and it’s a bit embarrassing), but I think that at the root of it was simply a dearth of quality communication in Chinese. 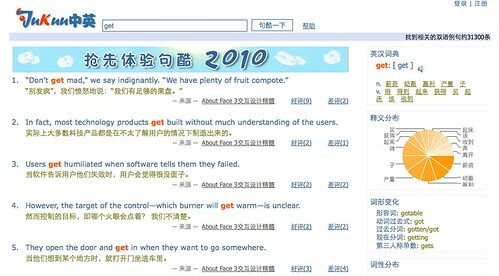 After starting my own company in 2010 and working with all Chinese staff all day every day in Chinese, I no longer felt a need to use Chinese in every other interaction, because I had my fill. So, to those of you who, like me, like to ponder these sociolinguistic issues, I ask you: do you participate in language power struggles? Do they annoy you? Is your emotional reaction to them (or lack thereof) a factor of your own personality, or do you think it’s related to “having your fill” practicing Chinese? How big of a factor is linguistic insecurity? P.S. I like the “Han Solo-Chewbacca communication” concept Jared brought up in the podcast! A better title for this post would be “never trust a native speaker completely.” We all know instinctively that the mind of a native speaker is an essential resource for learning a language. Put enough of these native speakers together, and you can create the immersion experience which all learners crave in order to truly level up their fluency. But as for an isolated, individual native speaker… there are a few issues to keep in mind. Put simply, most native speakers don’t know their language inside and out. Sure, they can speak their native language, and maybe even write it well. But when you start asking them more “meta” questions, many native speakers will struggle to give a straightforward or meaningful answer. – Why is this wrong? – What is the difference between these two words? – How do you express this obscure idiomatic phrase from my language in your native tongue? A lot of times, the native speaker honestly wants to help, but they’re just not equipped to do so. Being masters at their own native tongue does not make them qualified to answer your metalinguistic questions. They may even refuse to answer your crazy learner questions (and in some cases, they may be well justified, since we learners tend to over-analyze at times). So while it sounds strange to call a native speaker ignorant of his own language, when it comes to the “meta,” most native speakers are. When it comes to the problem of ignorance, this is where language teachers have a huge leg up on the average joe. Especially experienced language teachers will have addressed the “why is this wrong” and “what’s the difference between these two words” many times, and will have gotten good at them. They might even be so good that they can give simple answers that enable you to grasp the essence and move on, instead of needlessly delving into endless minutiae. OK, some some native speakers do have some meaningful metalinguistic insight into their own language. They might be language teachers, or translators, or just people that like to reflect on the peculiarities of their native tongue. These people are super helpful, and likely even enjoy answering your questions, so they’re great to have around. – The “how greetings”: How’s it going? How are you doing? – The “what greetings”: What’s up? What’s new? What’s going on? When a few of my students wanted to say “how are you going?” I made quite clear that this was wrong (bad English), and they were not to say it. It wasn’t until years later that I learned that Australians regularly say “how are you going?” To make matters worse, some of the students I taught were preparing to study abroad in Australia! I meant well (and those students seriously needed to learn some new informal greetings), but I presumed to speak as the authority on the entire English language (at the ripe old age of 24, no less), as an American, without even having substantial contact with non-American English. And that was just overstepping my bounds. I was cocky. It’s surprisingly easy to do this as a teacher, though, even if you’re pretty sure you’re not cocky at all. 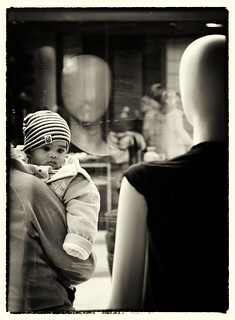 There will always be weird exceptions and unfamiliar dialects, as well as new expressions coming into vogue. Teachers do their best, I know, but it can be difficult to play the role of “language authority” without buying into the vastness of one’s own “enlightened native speaker” knowledge at least a little. This is what I was alluding to at the end of the last section: it just isn’t possible to know everything about a language, even if you’re an educated native speaker. You could spend a whole lifetime studying just the differences between similar words. You could spend a whole lifetime studying just the differences in dialects of your native tongue. You could spend a whole lifetime studying just what words are falling out of common usage (becoming outdated), and what new words and phrases the kids are using these days. But what you can’t do is all of those things, in one lifetime (and definitely not by the age of 24). In Linguistics 101 in college I was intrigued by the the concept of the ideolect, the idea that no single person uses the entirety of a given language, and no person uses the language they do use in exactly the same way. The entirety of a language exists as the sum of all speakers’ ideolects. It is inherently distributed (across the minds of speakers), and can never be fully centralized (except maybe by SkyNet some day?). This pretty much blew my mind. And so linguists and language teachers will make efforts to see beyond their own ideolects, and to see the fuller picture of the language they are trying to understand. But the human brain can only hold so much, and there’s only so much time. A language is a big thing. I hope I’ve convinced you that native speakers are fallible, and they cannot help but be so, when it comes to perfectly representing The Ultimate Truth about their mother tongues. But each has the most insight of anyone into his own ideolect. No, you can’t trust a native speaker. But you can trust native speakers, as a group. If it’s an important or tricky question, always get a second opinion. Better yet, if you’re an advanced learner, present conflicting evidence collected from multiple native speakers to those native speakers. This can produce fascinating insight for learners, and often for the native speakers themselves. Whether you’re a learner or a metalinguistic advisor on your own native tongue, though, my advice is the same: Stay humble. Stay curious. And talk to lots of native speakers. My daughter is almost 2 years old now, and as she talks more and more, not only is it a blast to see that this little crying pink thing has grown into a real human, but I’ve also got front row seats to the amazing phenomenon of first language acquisition. If you’ve never seen a kid acquire language from scratch, or have never seen it happen bilingually, there are bound to be a few surprises. It’s kind of messy, and sometimes it feels like a wonder that it even works. The other night my daughter displayed what you might call “neat presentation” of linguistic mastery. She asked for some water by saying “please water.” I gave her some of mine, and I could tell by her expression that it was colder than she expected. “It’s cold, huh?” I asked her. She nodded her head, repeating, “cold.” “It’s cold water,” I said. She nodded, repeating, “cold water, cold water.” Then she looked at her mom, and exclaimed with joy, “冰水，冰水!” (cold water, cold water). Wow, she’s already becoming a little translation machine! It’s not usually quite so orderly as all that, though. Then there’s the “little boy” and “little girl” case, which ties in nicely with the concept of linguistic relativity. I recently realized that my daughter didn’t know the words “boy” or “girl,” and didn’t know the Chinese for them either. This seemed a little strange to me, because I know that during the day her Chinese grandmother takes her outside a lot, and she plays with other kids. Shouldn’t she at least know the Chinese for 男孩 (boy) or 女孩 (girl) or 小孩 (child), if not the English? Well, it turns out that no, she shouldn’t know those words, because she rarely hears them. What she was learning was actually a bit more complicated than all that. Every time she encountered another baby that was male and younger than her, she was instructed to call him 弟弟, the Chinese word that literally means “little brother.” For girls younger than her, it’s 妹妹 (“little sister”). For little boys older than her, it’s 哥哥 (“big brother”), and for little girls older than her, it’s 姐姐 (“big sister”). This is fairly typical for Chinese kids. Of course, she doesn’t know the word for “man” or “woman,” either. She calls all women 阿姨 (that is, any female that’s not obviously still a child, much to the dismay of the 20-year-old young ladies she encounters), which traditionally means “auntie,” and all adult males 叔叔. She especially enjoys identifying every 阿姨 (“auntie”) she sees, whether it be a woman on the street, a female mannequin in a store, or even a drawing of a woman in an ad. Meanwhile, I’m lamely trying to remind her that there are English words for all these people, starting with “boy” and “girl,” and maybe it’s my imagination, but could it be she’s having a hard time accepting the words I offer because they don’t match her existing mental map? More exposure is all she needs, of course… I certainly won’t make it any more complicated than that; I’ll just keep throwing natural English at her (I don’t speak to her in Chinese). But it’s certainly fun to watch her deft little brain running through these semantic mazes. With continued exposure, she’ll make it through, no matter what Chinese (or English) throws at her. > Ok, how’s my Chinese now? It’s better than when I started. I’ve certainly seen a lot of vocab and patterns. A few of them are in my daily speech now. I’m not terribly worried that I haven’t internalized more of those yet… it’s not my first rodeo. I know that some of that stuff will start coming out of my mouth in the months to come. > I actually discovered this phenomenon when I got back from France in 1993. My French had improved tremendously from the immersion experience, and I had plenty of new frenchy habits. But I was a little disappointed that my French wasn’t even better. I would go to French class in Seattle and make a lot of the same mistakes I had made before. Oh well, I thought, I didn’t get fluent, but at least it was fun. > Fast forward to a year later, and I was totally able to speak French. So apparently the growth came after I had returned, after the immersion experience was long over. Of course there’s a big catch. You have to keep talking, keep practicing, keep trying to improve. That’s certainly no problem for JP, but some learners may think that all the magic happens in one special context at one special time, and once extracted from that special environment, all the learning stops. Not so! The jury is still out an exactly how closely related first and second language acquisition are, but clearly the two are related. One of the things that gives me great pleasure is watching my (not-yet-two-year-old) daughter soak up new words, earnestly taking them all in, but refusing to repeat them. And then, days or weeks later, she’ll suddenly bust out with those words in the appropriate context, much to the amazement of her audience. No, it’s not a deliberate show. Her brain needs time to properly “digest” what she’s ingested in order to put it to use. For me personally, some of the most interesting phenomena relate to Chinese grammar. There are certain higher-level grammar patterns that you can learn, and know, and understand in context, but then just never use yourself in normal conversation. Why bother with something like 之所以……是因为 when you can just use the regular cause-effect pattern? Or why bother extracting the object and with a 把 sentence and moving it around when you can get by with a regular SOV sentence? The answer, of course, is that all this stuff adds nuance. But you filter out nuance when you’re not ready for it. 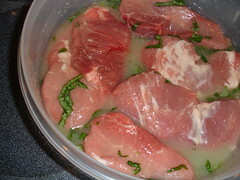 Then you marinate in nuance for a while before you’re ready to fully embrace it yourself. Then one day the nuance just pops out of you, expressing just what you meant, and you didn’t even know you had it in you. To get to that point, you just have to keep accepting that input while continually giving yourself opportunities to communicate. Code-switching is a well-researched linguistic phenomenon, and you can go into it way deeper than the NPR article does (just check out the references of the Wikipedia article on code-switching). So assuming that non-comprehension isn’t a factor, what are the circumstances under which code-switching becomes annoying? I would guess that a flagrant violation of reason #5 above would be the most annoying… switching to another language to express a thoroughly generic concept, rather than for a “culturally justified” reason. Worse yet: doing that repeatedly. This was the one that came up in my recent conversation. I’m pretty tolerant of code-switching, though. Maybe you readers have other reasons to add? 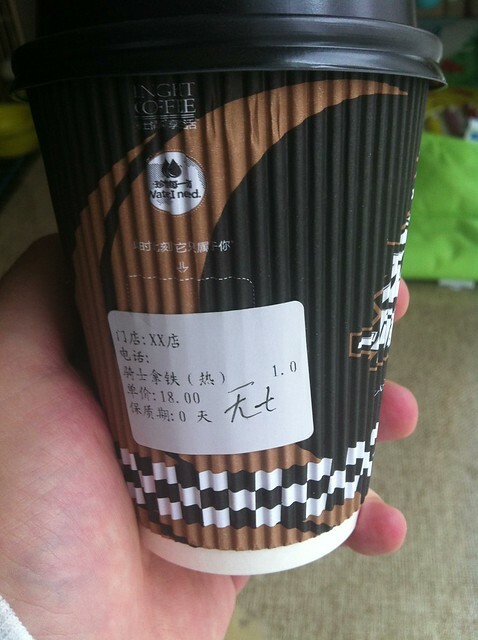 “No sugar” or “sugar-free” in Chinese is 无糖. The character 无, in its simplified form (not 無), is not particularly difficult to write. It’s barely more complex than “#.” The character for “sugar,” however, is a different story: 糖. Kind of complex. Modern Chinese people grow up being equally familiar with the Latin alphabet and Chinese characters. Writing by hand is becoming less and important, and writing characters is sometimes seen as a burden. Typing on a computer can make it easier to type out complex characters (because you’re not actually writing out all the strokes anymore), and yet young Chinese people on the internet are mixing the Latin alphabet into Chinese quite liberally. It does make you wonder how quickly we’re going to start seeing fundamental changes to the way Chinese people write. 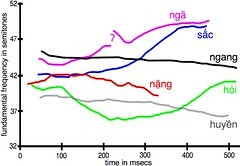 All languages change over time, although the written language often resists change much longer. But there’s a new catalyst in the equation this time: the internet. Do you remember “solving for x” in math class? When you first started algebra (or was it pre-algebra? ), you had to learn a whole new set of methods which, when applied, could magically reveal the values of the unknown variables. …before long you could handily solve for x. And once you had x, you could solve for y. Then z was a piece of cake too. So how are the sounds of Mandarin like algebra? Well, just as the in the above algebra example one would first solve for x, then solve for y, and finally solve for z, learning those “alveolo-palatals” involves a similar chain effect. Once you’ve solved for “x” (I’m talking the pinyin x here), “q” and “j” both become relatively simple. “X” is definitely the one you want to start with, though, for many reasons. X is the unknown. First solve for “x,” and “q” and “j” are within your grasp. Second, the “x” consonant contains the basic feature you need to build on to learn “q” and then “j.” Just as solving for x in the algebra equations above allows you to solve for y with a simple operation, the same is true for pinyin “x” and then “q.” Allow me to explain. If you’ve studied phonetics at all, you learn IPA (the international phonetic alphabet). The main idea behind IPA is that as nearly as possible, every unique sound is represented by a unique symbol. So one good way to know if a sound in a foreign language is really equivalent to a sound in English is to check their respective IPA notations. In English, for example, the “sh” sound isn’t actually an “s” sound plus an “h” sound. We just write it as “sh.” In reality, it’s a sound different from all the other sounds in the English language. It gets its own IPA symbol: ʃ. Makes sense, right? 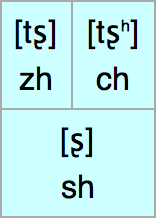 Now, a lot of new learners to Chinese think that pinyin “x” is the same as English’s “sh.” If that were true, the IPA symbols for the two sounds would be the same. But they’re not. If there is any doubt that the pinyin “x,” “q,” and “j” sounds are foreign for speakers of English, you can look up the IPA for the sounds of Mandarin Chinese. Don’t freak out, now. The alien symbols representing pinyin’s “x,” “j,” and “q,” are, respectively, ɕ, tɕʰ, and tɕ. Now take a look at those three consonant sounds again: ɕ, tɕʰ, tɕ. The common element is ɕ. That’s the “x” sound. This sound does not exist in English; “x” is the unknown. 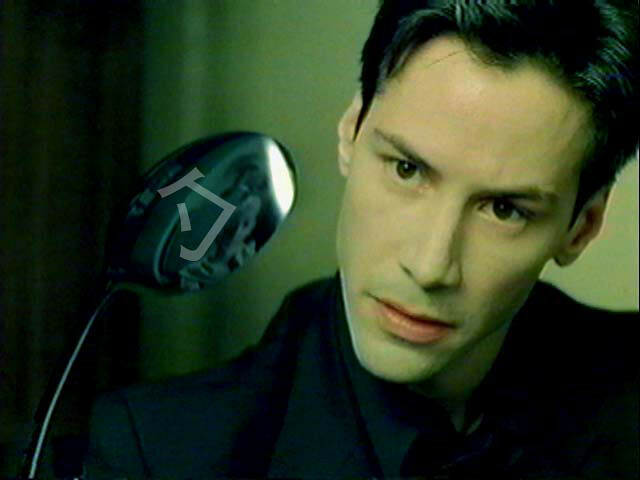 But the addition of the other sounds, which are not foreign to English speakers, will result in the “q” and “j” sounds. It’s worth it, though. Before long you’ll leave “syeh-syeh” behind and utter “xièxie” perfectly. Just solve for “x” first. I’ve been asked a number of times: if Mandarin Chinese is a tonal language, what happens when you sing in Mandarin? Well, the answer is the melody takes over and the tones are ignored. Pretty simple. > For Chinese, modern songs in Mandarin and Cantonese exhibit very different behaviour with respect to the extent to which the melodies affect the lexical tones. In modern Mandarin songs, the melodies dominate, so that the original tones on the lyrics seem to be completely ignored. 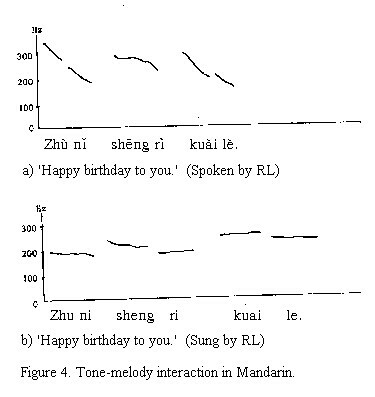 In Cantonese songs, however, the melodies typically take the lexical tones into consideration and attempt to preserve their pitch contours and relative pitch heights. 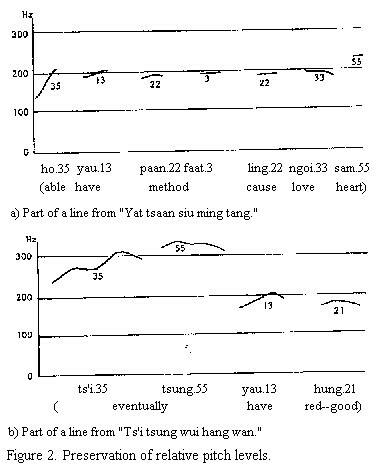 I can’t say I’m fully convinced by the pitch contour graphic that the Cantonese songs “take the lexical tones into consideration,” but it’s an interesting argument. This would suggest that studying songs would be more beneficial to acquisition of tones for the student of Cantonese than for the student of Mandarin. If you’re interested in this kind of thing, Professor Marjorie K. M. Chan has lots of articles available on her website’s Publications page. – The sample sentences in the screenshot above are all taken from About Face 3, a well-known book on goal-directed design, which has been published in multiple languages. – Jukuu offers not only multiple translations (grouped by part of speech), but also the distribution of those various parts of speech in its database (that’s what the pie graph at the right represents). – Jukuu also offers other word forms (词形) for “get” (in this case, “gets,” “getting,” “got,” “gotten,” and even “getable”). – If you click on one of the translations in the top right, the resulting page shows you sentences with just that translation of “get” (for example, this one for 得到). This kind of thing is a linguist’s dream, and can only be accomplished by corpus analysis with part of speech tagging, which is a ton of work. It’s really cool to see a resource like this publicly available online. To follow up my recent massive post on Language Power Struggles, I’d like to highlight the responses of Dr. Orlando Kelm, a professor of linguistics, teacher of many years, and learner of multiple languages. Dr. Kelm’s experience is largely with Portuguese and Spanish, but he’s also studied Japanese and Chinese, among other languages. 1. Chinese perception of use of English: There is something interesting about Chinese adoption of Putonghua as a lingua franca, despite all of the regional dialects and local languages. As related to use of English, it’s almost as if people accept their local language for personal interactions and Putonghua for official interactions. From there it is a small leap to English for professional interactions. Recently when in Beijing I visited a multinational engineering company, German-owned even, but the official language at work was English. It was amazing to see rooms full of Chinese engineers, most who had never been out of China, all using English to talk to each other at work. It certainly strengthened my understanding of the way English was perceived as a professional tool, no different in some ways from switching among c++, php, html, or java. 2. Our skewed view: My guess is that the type of person who is interested in this blog represents a minority. No doubt, most of the world probably confronts mono-lingual English speakers who assume and demand English for all communication. Our frustration with people who want to speak English with us is most likely counterbalanced with a frustrated world that feels obligated to speak English, even when they feel inadequate in doing so. 3. John asked if my experience in Latin America (with Spanish and Portuguese) was similar to his in China with Chinese. The short answer is no, not really. Indeed I have run across people who insist on practicing English with me, and from a professional end English is everywhere, but the aggressive power struggle seems less in Latin America. My guess as to why… well, first I believe that Latin Americans think that English speakers who do not speak Spanish are just unmotivated or lazy, people who could learn it if they really wanted to. 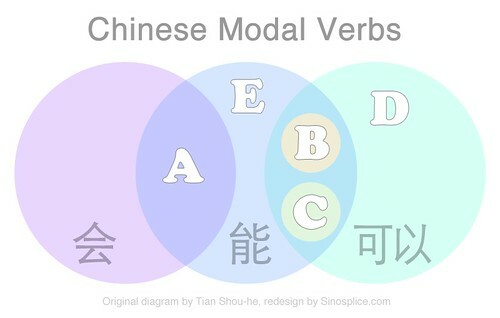 On the other hand, Chinese think of their language as “more difficult”. Deep down they must think that it’s easier for them to learn English than it is for ‘us’ to learn Chinese. Add that to the items mentioned by all of these blog comments, and we see that despite John’s cool proficiency charts, language proficiency is only part of choosing which language is used. Thank you also to all the readers that pitched in and shared your own observations. You’re certainly correct in that there are way more factors at play than I brought up in the original post. 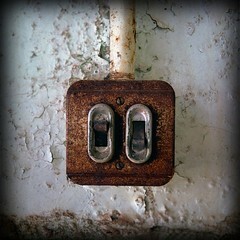 It’s been enlightening bringing it all together from so many different perspectives. 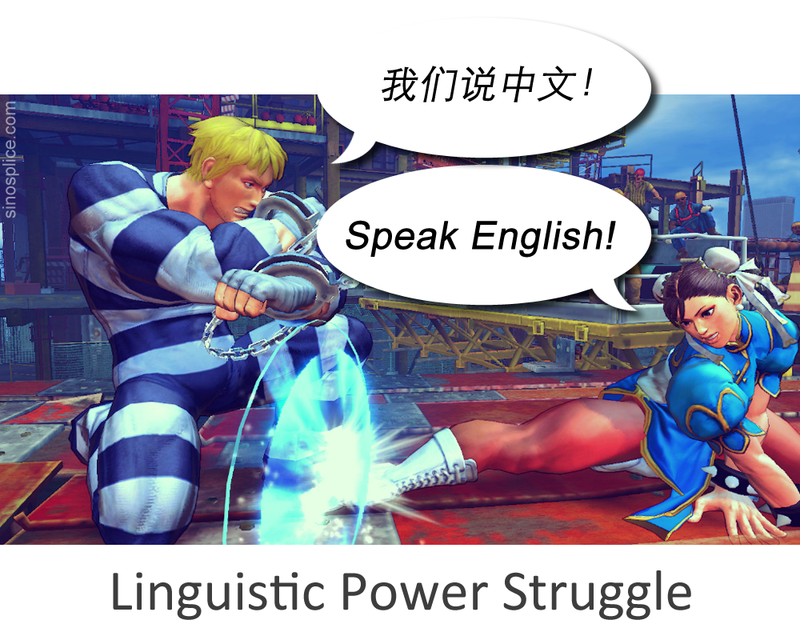 The idea of the “linguistic power struggle” is one I’ve been dealing with and thinking about for a long time. I’ve made some attempts to find scholarly research on the subject, looking into discourse analysis (which is often concerned with power), expectancy violations theory, and communication accommodation theory, but so far I’ve turned up very little (even outside of Wikipedia!). Thus the discussion which follows will be mostly descriptive and anecdotal, but will raise more questions than it answers. First, a typical example of the language power struggle. 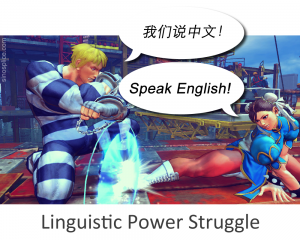 The dialog below is taken from a ChinesePod lesson aptly titled Language Power Struggle. I directed the creation of this fictional dialog two years ago, drawing on my own real experiences and those of other friends in China. The content in square brackets [like this] is a translation of the original Chinese. Note that the Chinese person speaks mostly English, while the American speaks only Chinese. Chinese: Sure, nice to meet you. Chinese: Your Chinese is very good. Chinese: How long have you been to China? Chinese: Oh, you are learning Chinese? Chinese: Oh. I think Chinese is very difficult for you. How do you feel this bar? Chinese: Ha ha! You are very serious! Chinese: I want to practice English. In Chinese, we say “[learn from each other]”, you know? Chinese: I like talking English with you. Chinese: I want to go to America. Let’s be friends. Can you give me your mobile number? The root of the conflict is quite clear: the American guy wants to speak Chinese, while the Chinese guy wants to speak English. There are quite a few issues contained within this small dialog, though. Below I’ll get into more details. – Sinoglot: language in China, eclectically. 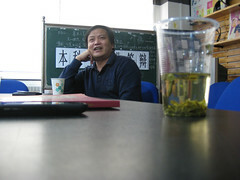 – Beijing Sounds: Beijing sounds, mostly language, through foreign ears. – The Annals of Wu: voices from the Yangzi delta. – Echoes of Manchu: information & discussion the Manchu language. – Yǔwén: Mandarin acquisition by Chinese children. – Naxi Script Resource Centre: information on Naxi writing and language. – Nothing Undone: an experiment in learning literary (read: classical) Chinese. – xiao er jing: life & language among China’s Muslims. Definitely a blog to watch. Note that the group blog is not merely an aggregator of the individual blogs; the group blog and the individual blogs have separate content. Note that the term “error” is used in the error analysis sense, meaning that it is committed systematically, and is not merely a random mistake (which even native speakers make from time to time). I remember quite clearly when I discovered myself committing the 3-2 Tone Swap error. 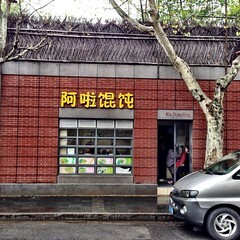 I had learned the word 可怜 (kělián) in Hangzhou from a friend. But I noticed that although I had “learned” the word, every time I tried to use it, my friend would correct my pronunciation. “No, it’s ‘kělián,’ not ‘kéliǎn. '” This was extremely frustrating for me, because I thought I had learned the word, and I was pronouncing it wrong even when I knew that the tones were 3-2. At the time I dismissed it as just a “problem word” that I would get eventually. Around this time I became super-vigilant about my tones. I realized that although I was communicating pretty well, I was still making a lot of tone mistakes. Part of this new awareness came when I realized that native speakers were correcting me all the time using recasts, but I had previously been oblivious to it. After having this same exchange about a million times, I had started to assume that it was just a natural conversational pattern in Chinese to have your country repeated back to you for verification. Yeah, it seems a little strange and inefficient, but there are stranger features of the Chinese language. What I eventually came to realize, however, was that when I gave my answer, 美国, I was routinely mispronouncing it as *”Méiguǒ” (3-2 Tone Swap error), and then the other person was both (1) confirming the information and (2) modeling it for me in his response, which included the correct form “Měiguó” (a classic recast). When I finally realized this, it sort of blew my mind. I had thought my tones were already pretty good, but I had been pronouncing the name of my own country wrong all this time?? Learning Mandarin Chinese is, if nothing else, an exercise in humility. There was nothing to do but hunker down and try to reform my pronunciation. While I found it easier to focus on high-frequency words like 美国, it quickly became apparent to me that the 3-2 tone swap issue was rampant in my pronunciation. Although the 3-2 Tone Swap phenomenon cropped up in my own experiment on tonal pairs for my masters thesis, it was not the focus of my own research. If anyone knows of specific research done on this phenomenon, I would love to hear about it. While all subjects illustrated the first trend, the second was particularly well demonstarted by an intermediate-level French subject, who routinely pronounced “Fǎguó” [France] correctly, despite the existence of a 3-2 tonal pair, but then also routinely pronounced “Měiguó” [The United States] incorrectly as *”Méiguǒ” (the 3-2 Tone Swap). What this suggests is that although some tonal pairs seem to take longer to master, the mastery is not categorical. In other words, you don’t suddenly “get” the pronunciation pattern and then just switch over to correct 3-2 pronunciation for all words where it occurs. Acquisition of the 3-2 tonal pair appears to be occur more on a word-by-word basis, making it largely a matter of practice, practice, practice (which also explains the better performance with numbers). This mirrors my own experiences. Tonal mastery is a long process for most students, with the 3-2 tone pair appearing to be one of the last patterns to acquire. Why? I suspect that there is a relationship between the 3-2 Tone Swap error and the 3-3 tone sandhi (in which 3-3 tonal pairs are systematically converted to 2-3). The learners that exhibit the 3-2 Tone Swap error typically do very well with their 3-3 sandhi. Could learners be internalizing but then overextending the 3-3 tone sandhi rule to include not only 3-3 pairs, but also 3-2 pairs? It’s certainly possible. Again, if anyone knows of any research into the above phenomena, I would appreciate links or more information!